I’ve always believed that good food doesn’t always have to be expensive. Although I appreciate the gastronomic experience I can get from a fancy restaurant, I also enjoy the affordable treats offered by street vendors. Of course, eating street food is a risky affair. More than once, I’ve been warned by my mom and my aunty about my fondness for street food. Admittedly, I have had my fair share of food poisoning cases. For the most part, however, I still think that if you choose wisely, you can definitely enjoy the many food choices you can get from street carts! 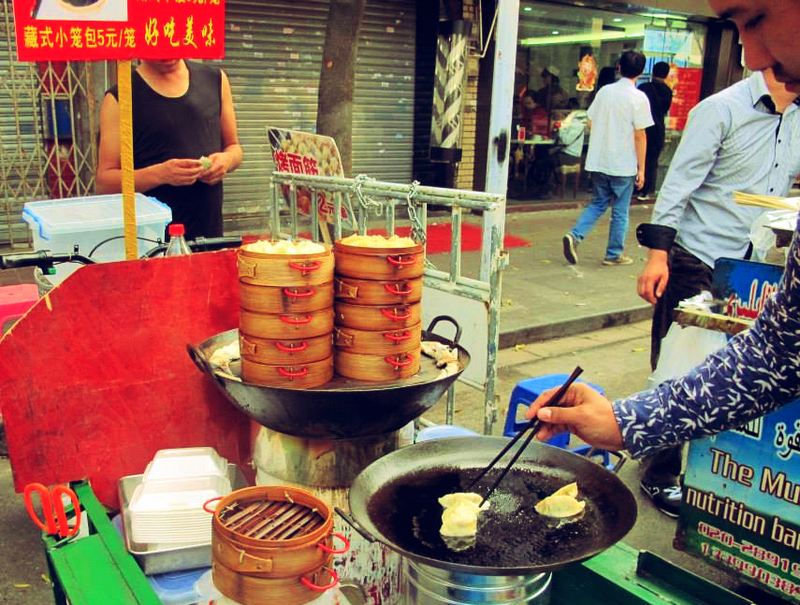 Guangzhou, in particular, offers a wide variety of street food options. In fact, you can find vendors in almost every street corner. One time, I even saw some enterprising people set up shop on an island in the middle of the street. Since these “restaurant” can be loaded in a cart and unloaded in a matter of minutes, mobility is never a problem. 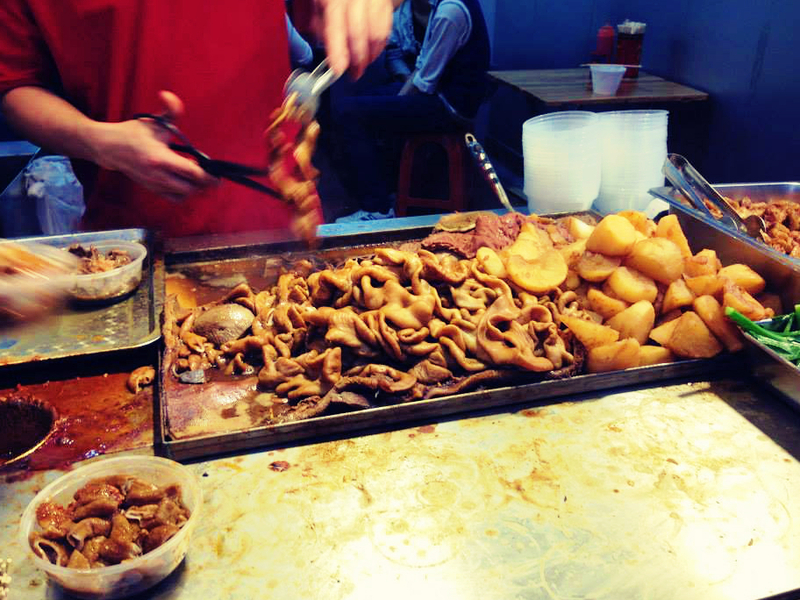 One of my favorite areas for street food is called Changshou Lu, located at Line 1 of the Guangzhou Metro. This busy shopping district is home to street stalls and small local eateries selling the most interesting kinds of food! 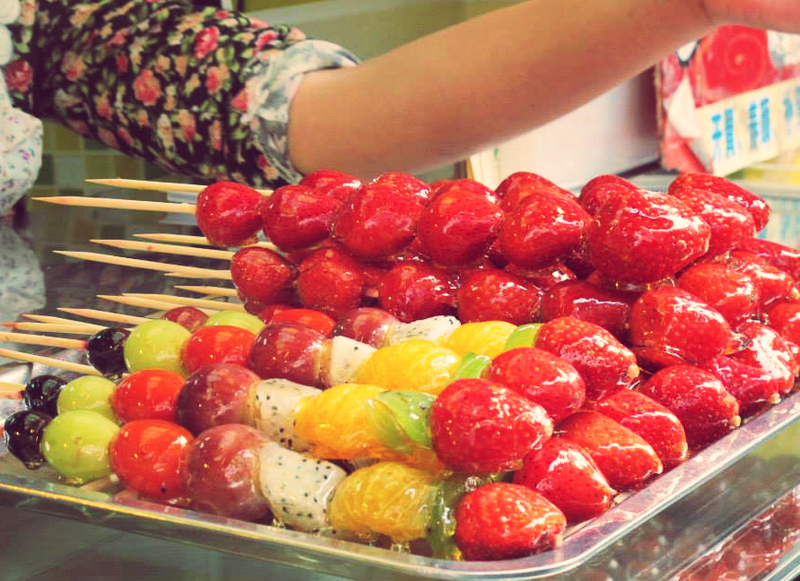 One of my favorites is the one above – fruits skewered on sticks and glazed with sugar. 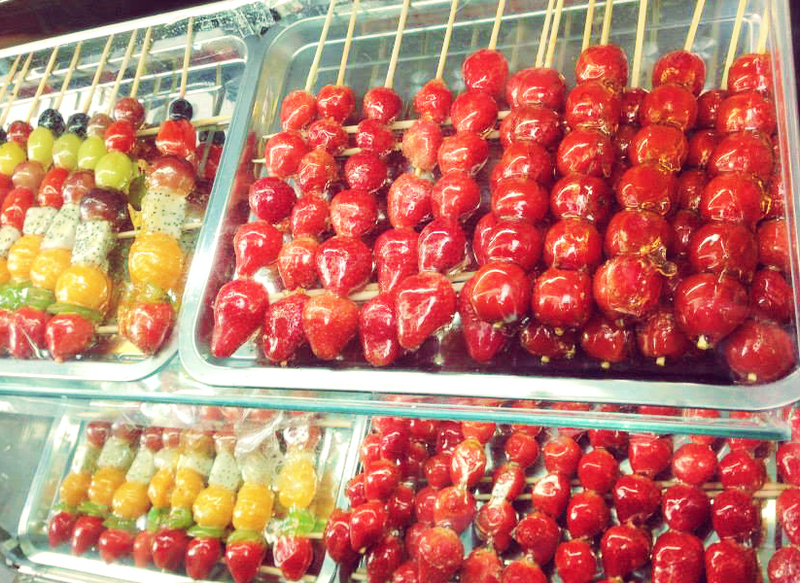 It’s a variation of a traditional Chinese dessert called the Tánghúlu (literally candied fruit), which has skewered sour red hawthorne fruits dipped in a sweet sugar glaze. 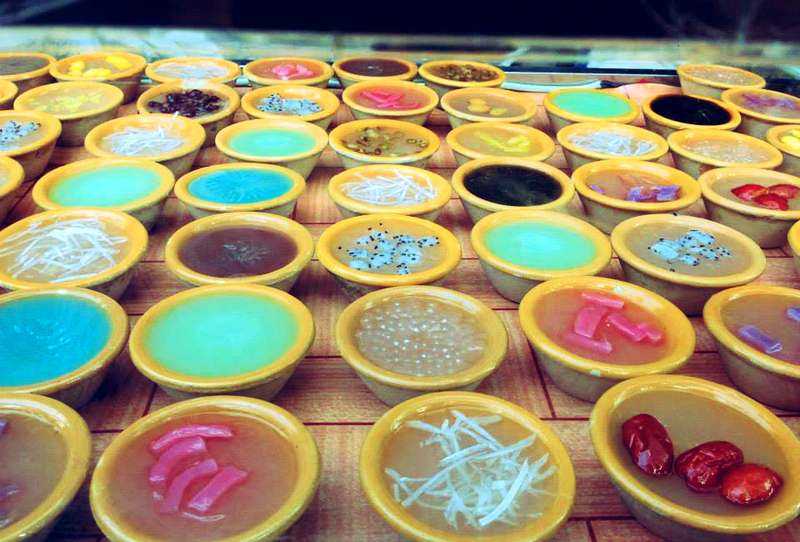 If you liked how colorful the fruits were, you will also like these colorful jelly desserts. I’m not exactly sure if all of them taste good, but they sure look very pretty! My next favorite dish might sound strange and I found that not everyone likes it as much as I do. 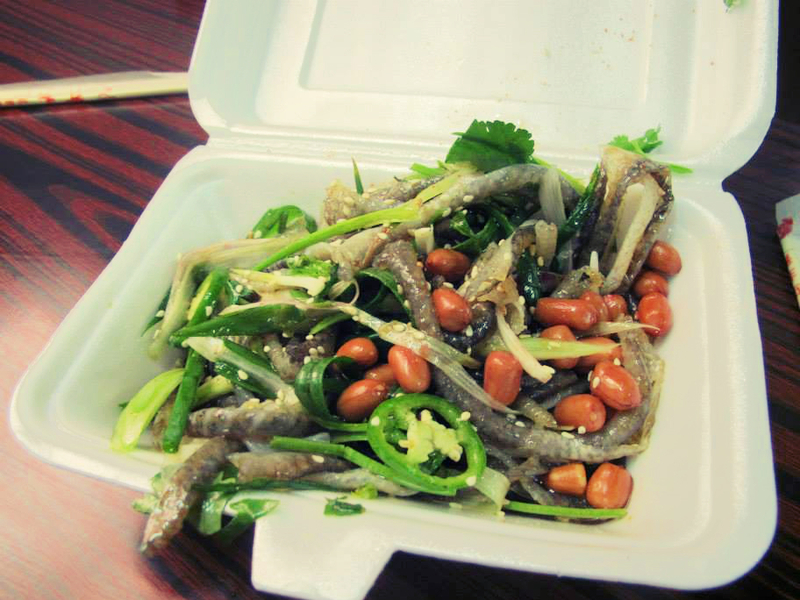 It’s fish skin salad (shown in the picture below). It has chewy fish skin tossed with spring onions, cilantro, and nuts and drizzled with some sort of sesame seed vinaigrette. I guess the idea of eating fish skin may be off putting to some, but I love it! It’s not as fishy-tasting as you would expect it to be because the vinaigrette tames it down a bit. Speaking of strange, I’ve never been one to turn down unusual food. In fact, I’m quite experimental with my food choices. I would like to try everything at least once. So far, I’ve tried crocodile meat, frogs, and silk worms. The picture below is of cow intestines with radish. This one I quite enjoy because they serve it with this flavorful broth. Some are extra chewy, though, and those ones are not so good! Now back to safer food options. 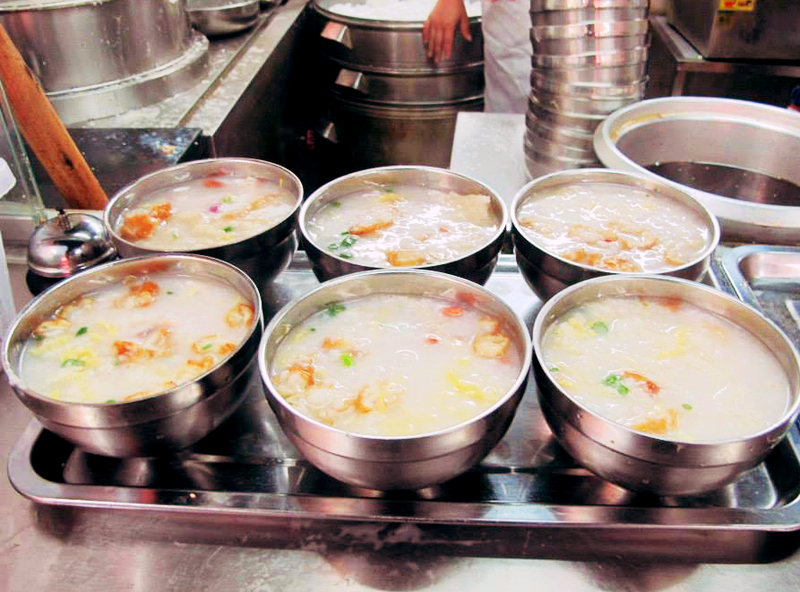 Congee (rice porridge) is very common because it’s a local favorite. I love congee too especially when I’m feeling a bit under the weather. It’s a very comforting dish. 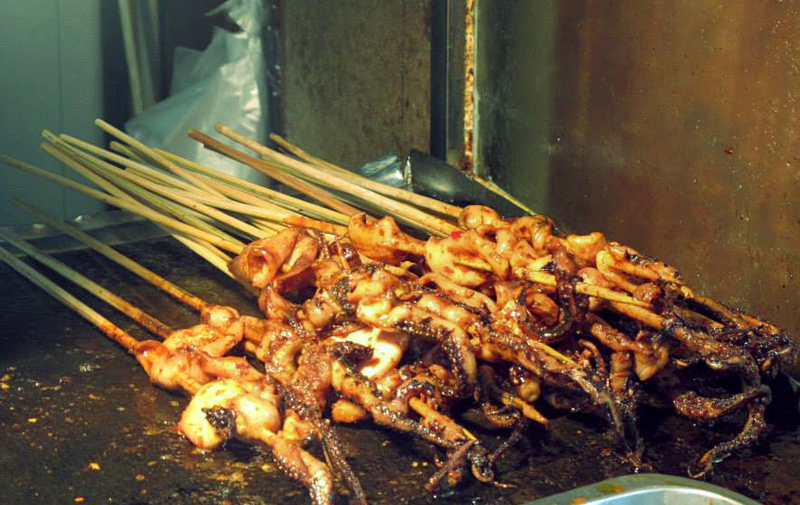 Another common sight among street vendors is skewered squid. Usually, you get three or four pieces for 10RMB (PHP70). If you want to try this, make sure to tell them not to make it too spicy (if you’re not much into spice, that is). Otherwise, they will liberally sprinkle it with chili! 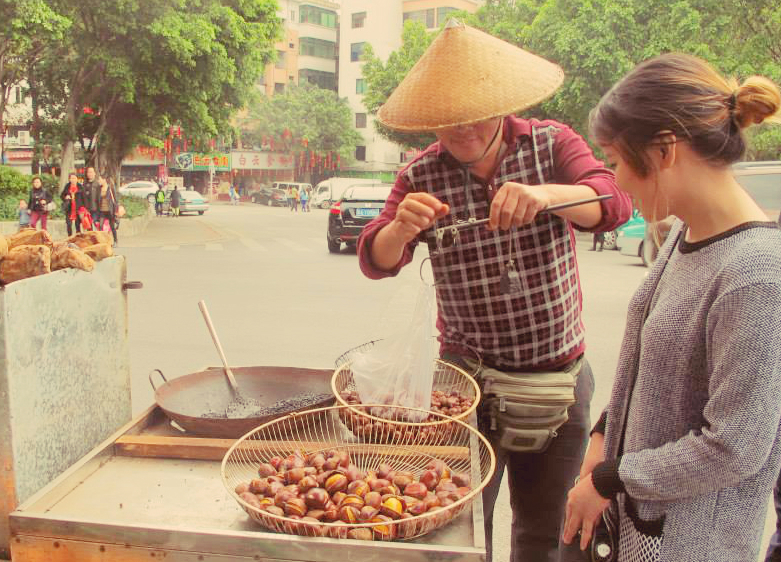 During the holidays, I found a lot of chestnut vendors around. Chestnuts remind me of Christmas! I always make it a point to buy packet of it when I see it on the street. It’s my favorite snack. When you get thirsty after all that eating, check out the carts selling fresh fruit juice. 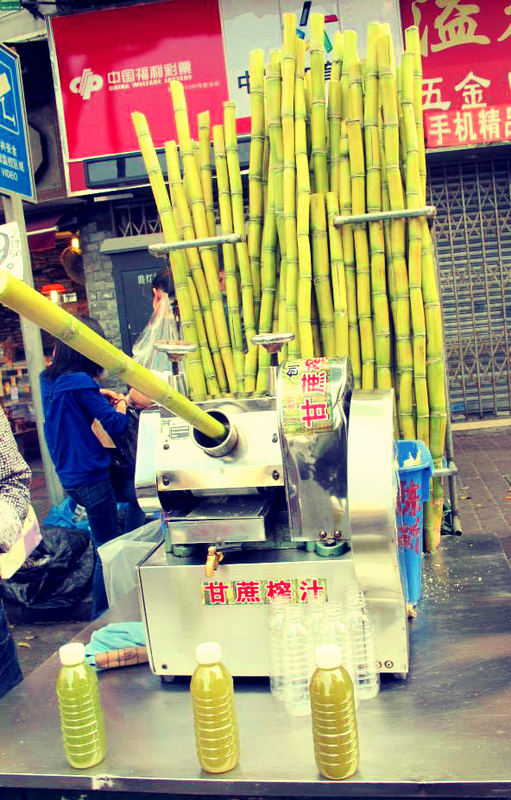 The one below sells sugar cane juice, but you will also find people selling freshly squeezed orange juice and coconut juice. All are very affordable. As you can see, street food here is not just about grab and go. Some people set up tables and chairs on the sidewalk so you can enjoy your meal with friends and even have a few drinks. 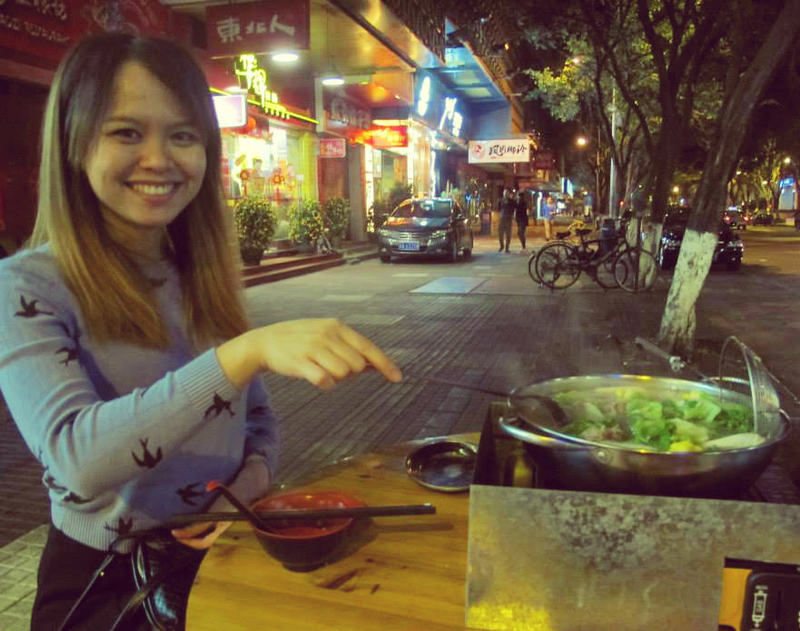 Above, I’m enjoying a hotpot dinner with my friend. 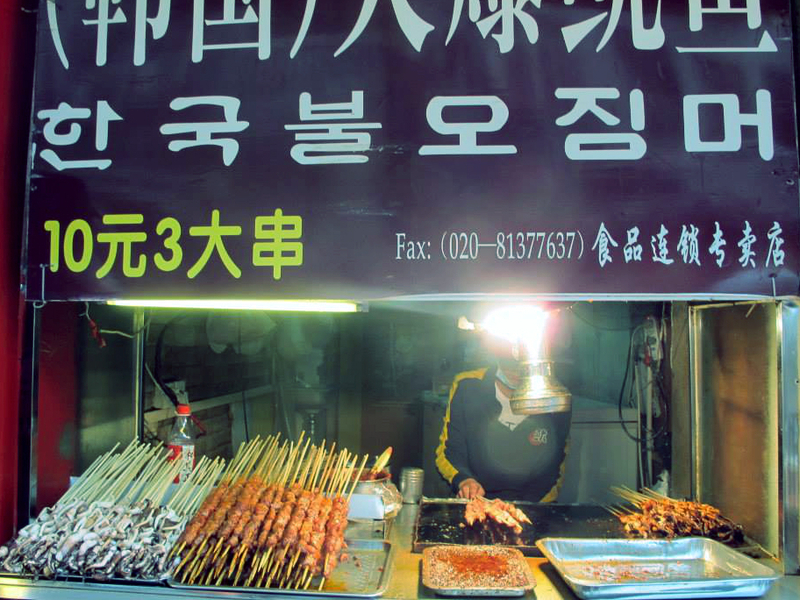 What sort of street food do you have in your area? Do you like street food? To eat street food in other country seems no big deal but here, I mean, it is just really different. but don’t get me wrong, I also eat isaw, dugo, calamares, penoy.. hehehe. I like the concept of how they specialize on a certain dish and maintain smaller stores like a dumpling store will be a dumpling store and not a full scale restaurant since it’s easier and cheaper to maintain it that way. Nice you’re enjoying the food there Mich.